QUEENSLAND farmer representative organisation, AgForce, and off-road vehicle manufacturer, Polaris Australia, are joining together to help save lives and prevent accidents on farms by raising awareness of the importance of operating off-road vehicles correctly with the appropriate safety equipment. 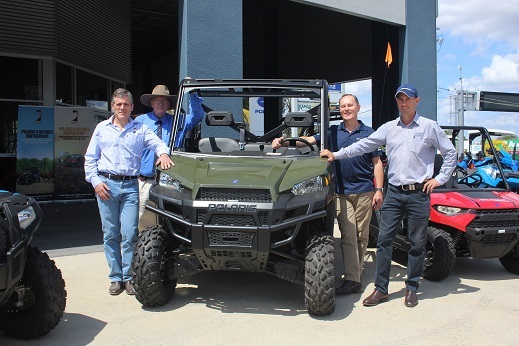 AgForce Queensland chief executive officer Michael Guerin and Polaris Australia national sales manager Glenn Veal have announced a new corporate partnership that would give AgForce members access to safety training and significant discounts on Polaris vehicles, parts and accessories. Mr Guerin said off-road vehicles such as quad bikes and side-by-sides were an essential piece of equipment for many farmers, but were also among the biggest cause of deaths and accidents on Australian farms. “Over the past 15 years, 69 people have been killed in quad bike accidents in Queensland – almost a third of the national total – and many more have been injured,” he said. “AgForce encourages primary producers to operate quad bikes, side-by-sides and all-terrain vehicles that are within manufacturer guidelines and fit for purpose, utilizing training and using appropriate safety equipment. Mr Veal said Polaris was a world leader in off-road vehicle innovation and driver/rider safety is the company’s top priority. “Polaris dealers have a strong association with regional Queensland and a long history of supporting farmers so we see this partnership as a great opportunity to educate and build awareness of our products and the importance of using them safely,” he said. Mr Guerin said AgForce and Polaris would also advocate for the Queensland Government to introduce a quad bike safety rebate program similar to what is already available to farmers in New South Wales and Victoria. “We believe State Government rebates towards the installation of operator and crush protection devices, alternative vehicles such as side-by-sides, and helmets, would go a long way towards improving quad bike safety on Queensland farms,” he said.